A report released Tuesday by Shareaholic, a maker of digital tools that help get content get distributed, discovered and shared across the web, tracked 200,000 publishers reaching 250 million people monthly to reveal referral traffic trends from eight of the largest social networks over the past 13 months. The data shows year-over-year growth for Facebook, Pinterest, Twitter, YouTube, and LinkedIn, decline for StumbleUpon and Reddit, and unimpressive numbers from Google+. 1) Facebook, Pinterest and Twitter are dominating. These three social media power players collectively accounted for 15.22 percent of overall traffic last month. Given their community and share-friendly nature, it's no surprise that they top the list in traffic referrals and have grown more than 54 percent each in share of overall visits. Facebook grew 58.81 percent, Pinterest by 66.52 percent and Twitter 54.12 percent. Pinterest's growth is especially interesting now that the company is flirting with paid advertising. 2) StumbleUpon and Reddit referrals are declining. The now profitable discovery engine StumbleUpon made its first acquisition last month swooping up 5by, yet their share of traffic driven to online publishers declined 27.47 percent. Reddit, the effortlessly odd social news site, experienced a 35.16 percent decline in their respective share of referrals (comparing September of last year to the same month this year). 3) YouTube and LinkedIn are gaining share. Although YouTube and LinkedIn aren't topping the leaderboard (yet), they're growing fast. Their share of overall traffic to publishers increased 52.86 percent and 34.51 percent respectively. Everyone loves YouTube (and probably spends more time on it than they should). That's simple. LinkedIn's growth can partly be attributed to the popularity of the Influencers program and its disruptive media model. 4) Google+ isn't yet competitive. Although Google+ referred a fair number of visits to online publishers last month (0.04 percent is a substantial number when we're looking at a data set of hundreds of millions of visits), it is hardly a leading referral source. Google+ is consistently dwarfed by the competing social media sites. The Daily Muse (via Mashable) notes that there is a lot of conflicting data relating to Google+'s relevance as a social media platform. Our data suggests it probably shouldn't be a top priority for digital marketers, but -- of course -- that can change at any moment. (Note: At the same time, we're not saying marketers should exclude it from their marketing mix entirely). 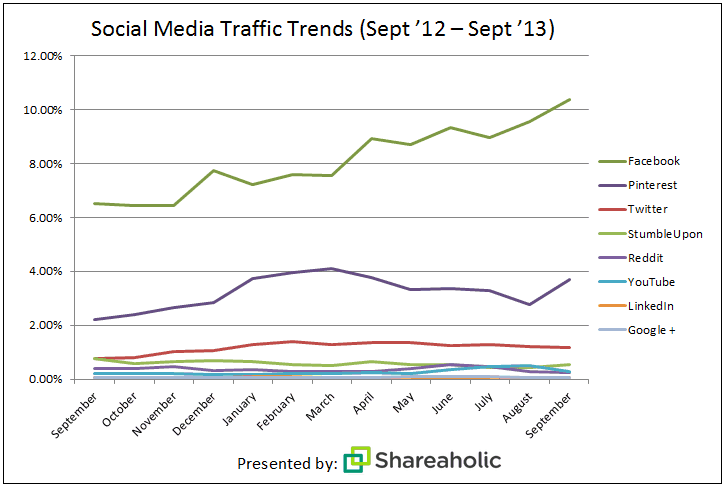 How have traffic referrals from Social Media sites grown / declined for you? This post was originally published on the Shareaholic blog. For upcoming data reports by Shareaholic, subscribe to the Shareaholic blog. For past data reports, check them out here.